Easy Ways to Make Fresh Orange Juice .Juice word actually comes from the English language, namely juice and had been absorbed into the Indonesian into juice. The juice is a drink of juice or fruit mashed with how blended with added sweetener of sugar, syrup or milk or unsweetened natural also. 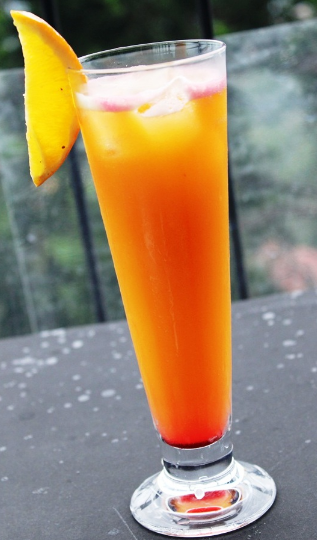 To produce juice drinks cold, not infrequently also be made ​​by mixing a few ice cubes in penghalusannya process. Many fruit juices made ​​one of them is orange juice. Orange juice is one of the many rows of fruit juice drinks that can be made with ease. This drink uses citrus flavorings mixed with sugar, milk and water. And following the Easy Way to Make Fresh Orange Juice which you can try yourself to dikreasikan in a glass of fresh beverage treats. Squeeze as many as three pieces and then dispose of the seeds. Prepare blender and fill with crushed ice that has been previously shared with the addition of condensed milk and sugar. Add also the contents in a blender with the lemon juice results. Grab a glass and pour blenderan results earlier in the glass. Fresh sweet orange juice ready served. to beautify the appearance of a glass of orange juice, you can insert a piece of orange with half cut round shapes and then pasted on the rim of the glass. It's easy to make drinks orange juice and only requires a few ingredients blenderan and grain alone. Suitable also diseruput to eliminate chills in the body and with vitamin C which is great for your body's needs. 0 Komentar Untuk "Easy Ways to Make Fresh Orange Juice"